3 nights hotel accommodation with breakfast Hotel Eurostars Plaza Mayor 4 * or similar. Arrival in Madrid and meeting with our driver and transfer to hotel. Delivery of welcome pack with information about the city. Wine and tapa in a typical bar. Accommodation. Breakfast at the hotel and tour of the city. 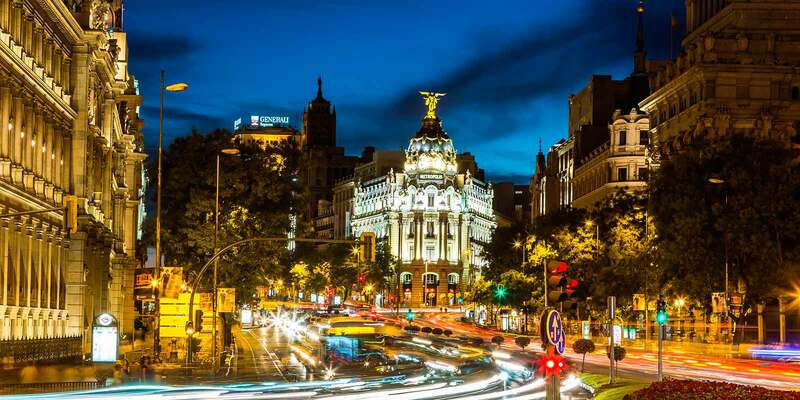 During this tour, we will know the most famous landmarks such as the Gran Via, Paseo de la Castellana, Plaza de Toros de las Ventas, Santiago Bernabeu Stadium... Lunch at Tapas Restaurant. Include the Afternoon bus to visit one of the most famous European Outlet, Las Rozas Village. They will have a VIP card with an additional discount on their purchases. Accommodation. Breakfast and departure to Toledo. 70 kilometers from the capital there is amonumental city where you will be able to enjoy its spectacular streets and you will be visiting places like The Synagogue of Santa Maria La Blanca and Damasquinado workshop. Return to Madrid and a free afternoon. At night we will have a Flamenco show with dinner at a typical Tablao. Accommodation. Breakfast and transfer to airport. End of our services.